The short fiction of Thaisa Frank, author of the recent and widely translated novel HEIDEGGER'S GLASSES, has captivated readers for two decades, and now readers can rediscover many of those pieces, along with her mesmerizing, sensual new stories, in her new work, ENCHANTMENT, a collection of sixty-one stories including "The Cat Lover," "Silver" and "Sleeping in Velvet" and two longer story sequences, Night Visits, about a child who speaks for her voiceless mother and The Mapmaker, in which letters in an antique writing chest help a mother and daughter. 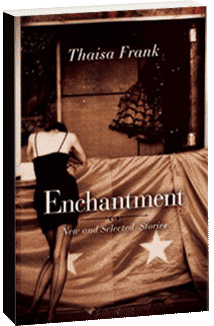 In ENCHANTMENT, Frank's characters - contortionists, circus masters, angel channelers, pre-Raphaelites, a chaotic family with a mother who turns night into day - bravely explore the strangeness of the world through ever-surprising encounters. In the new title story, a lonely mother and housewife orders an enchanted man from a website called The Wondrous Traveler: He arrives with instructions for use and a list of frequently asked questions about enchantment. In another of the new stories, “Thread,” two circus performers who pass through the eye of a needle become undone by a complicated love triangle. And “The Loneliness of the Midwestern Vampire” transcends the current genre to cast a poignant and human light on vampires in the heartlands, as the undead try to normalize their darker passions. These vibrant, compelling stories examine the distance between imagination and reality, showing us new ways we might bridge that gap in our attempts to reach one another.